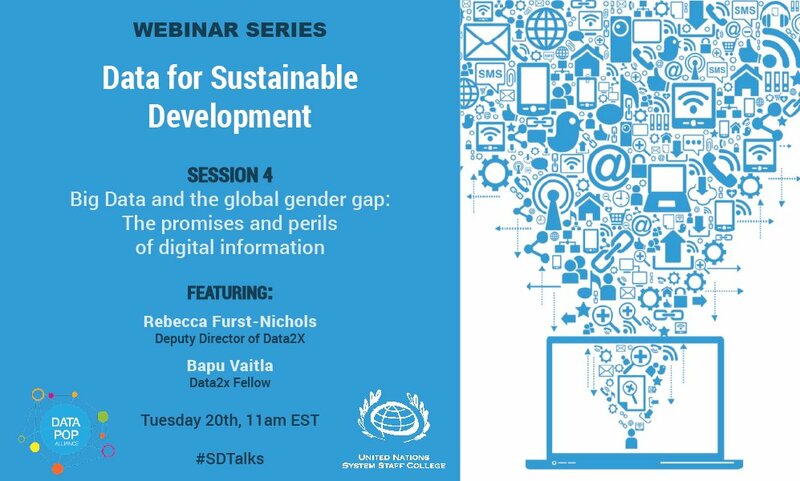 After the successful launch of our SD Talks Special Series on Data for Sustainable Development in 2017, we are pleased to announce the fourth webinar session of the series. Organised by the UNSSC Knowledge Centre for Sustainable Development in partnership with Data-Pop Alliance, the fourth webinar session on ‘Big data and the global gender gap: The promises and perils of digital information’ will be held on Tuesday, 20 March 2018 at 04:00 PM CET. The webinar will introduce the concept of gender data, explaining how good data on women and girls can be leveraged to promote gender equality, alleviate poverty, and advance development progress. It will explore the opportunities and risks of gender data use, and its implications for girls’ and women’s lives and realities.